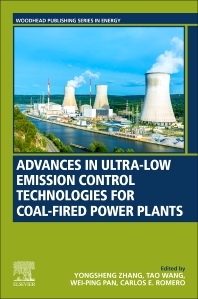 Advances in Ultra-low Emission Control Technologies for Coal-Fired Power Plants discusses the emissions standards of dust, SO2, NOx and mercury pollution, also presenting the key technologies available to control emissions in coal-fired power plants. The practical effects of ultra-low emissions projects included help the reader understand related implications in plants. Emphasis is placed on 300MW subcritical, 600MW subcritical, 660MW supercritical and 1000MW ultra-supercritical coal-fired units. The influence of different pollutant control units, such as wet electrostatic precipitator, desulfurization equipment and the electrostatic precipitator are also analyzed, and the pollutant levels before and after retrofitted ultra-low emissions are compared throughout. Professor Zhang began his career as a Technician at Labor Industrial Company of Shanxi Province, China, before working as a Post-doctoral research fellow at Institute of Engineering Thermophysics, Chinese Academy Sciences. He lectured at the Faculty of School of Energy, Power and Mechanical Engineering, North China Electric Power University, and is now an Professor specializing in Mechanical, Environmental Chemistry and Chemical Engineering. He has published over 400 journals across Elsevier journals such as Fuel and Journal of Environmental Sciences. Dr. Wang received the B.E. and Ph.D. degrees from North China Electric Power University, Beijing, China in 2010 and 2015, respectively. From 2013 to 2014, He was a Visiting Scholar at Princeton Plasma Physics Laboratory (PPPL), He is currently a lecturer in North China Electric Power University. His research interests include the applications of plasma for flue gas pollution control, mercury adsorption in thermal power plant. Professor Wei-Ping Pan received his B.S. degree in Chemical Engineering from Chung Yuan University, Taiwan and his Ph.D. in Physical Chemistry from Michigan Technological University in 1986. Dr. Pan has taught at Western Kentucky University since 1986. Dr. Pan was named the Sumpter Professor of Chemistry at Western in 1993 and was named a Fellow of the North American Thermal Analysis Society (NATAS) in 1997. He also received the Distinguished Service Award from NATAS in 2004. Dr. Pan has been selected as the 2008 recipient of the Mettler Award. The award is the NATAS’ highest honor and recognizes distinguished achievement in the field of thermal analysis. Dr. Pan has published more than 140 peer-reviewed papers in the last 20 years, the majority of which are related to coal combustion and emissions, and materials characterization. He has pioneered work in the area of clean coal technology, emission control, and thermal analysis involving effluent gas analysis and has used the TG/FTIR/MS technique extensively in the study of many different types of materials. Research interests include: Coal combustion, emission control, nanocomposite, thermal characterization of polymers and materials. Dr. Carlos E. Romero is the Director and Principal Research Scientist of the Energy Research Center. He joined the ERC in 1995 as a Research Scientist after earlier positions in academic and government research. His most recent position was Associate Director of the ERC and Principal Research Scientist. Dr. Romero has over twenty-five years of experience in power generation research. His background is in the thermal sciences and combustion, with emphasis on chemical kinetics modeling. He is actively working in the areas of power plant performance improvements and emissions control, advanced instrumentation and control, and application of artificial intelligence techniques to the power industry. Dr. Romero has participated as a principal investigator in research projects for electric utilities in the US, Canada, Mexico, Europe and China. Dr. Romero has written more than 250 journal publications, conference papers and technical reports.